The right tires not only help contribute to your vehicle's handling and performance, but can also impact fuel efficiency and safety as well. 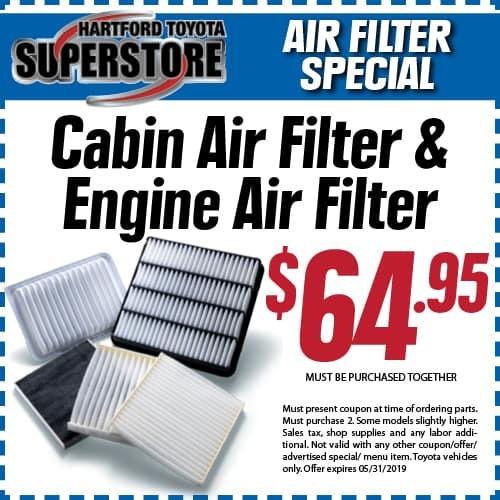 If your tires are showing signs of wear, you can get exact replacements for the original tires at a competitive price at Hartford Toyota Superstore Service Center. Our factory trained and certified Toyota technicians will ensure that your tires are mounted, balanced and inflated to match your Toyota vehicle's specifications. 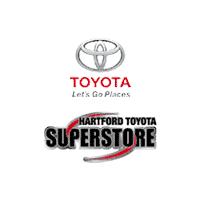 Keep your Toyota a Toyota by replacing your original tires at Hartford Toyota Superstore Service Center conveniently located in Hartford. 39.95 Conventional Oil Change, includes up to 5 Qts oil and filter, top all fluid levels. Tire tread life check, alignment check and battery check on every car that comes in for service. We also wash every car. Toyotas only. Shop charges extra. 54.95 Synthetic Oil Change, includes up to 5 Qts oil and filter, top all fluid levels. Tire tread life check, alignment check and battery check on every car that comes in for service. We also wash every car. Toyotas only. Shop charges extra.